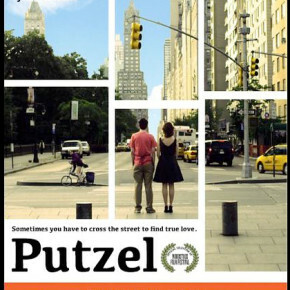 Putzel is a film for anyone who loves small-town living in a big city, smoked salmon, or pale geeky Jewish boys. And if you’re a fan of all three, well, strap in. Putzel tells the story of Walter, a late-twenties/early-thirties-something New Yorker whose goals include convincing his wife not to leave him and and running the smoked salmon shop his grandfather created. Oh, and he is terrified of stepping foot outside of the upper west side of Manhattan. While the film’s budget was a mere $200,00, and all the Upper West Side shots were completed in only eighteen days (b’sheret, anyone? ), it has all the trimmings of a much more expensive endeavor. All the important trimmings, anyway: Strong cinematography, excellent storytelling, and a stellar cast. There were no clear stand-out performances, as the ensemble was so strong it would be hard to rank one member above another. The cast is led by the tragically loveable Jack Carpenter (the pale geeky Jew to whom I referred earlier) and charming New Zealander Melanie Lynskey, along with John Pankow, Steve Park, Allegra Cohen (talk about your hot Jewesses), and Heeb-favorite Susie Essman, who takes on a much more understated and dramatic role than in many of the projects for which she is known, like Curb Your Enthusiam. Featuring Adrian Martinez, Fred Berman, Jarlath Conroy, Armando Riesco, and Fran Kranz (the good-looking manchild in the less-than good-looking fish uniform), Putzel introduces the audience to a range of differing personalities all inhabiting the same 2.48 mile radius. 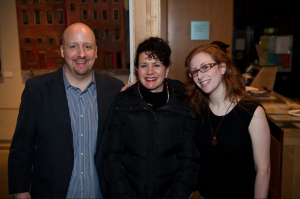 Tuesday night’s Manhattan screening at the JCC in Manhattan was sold out, filled with audience members both young and old. (Specifically, just young and old, as there was about a twenty-five year gap between the oldest of the young and the youngest of the old. You’d have been be hard pressed to find anyone both above thirty-five and below sixty.) Hopefully this bodes well for future screenings, which will be happening at film festivals in Pheonix, Florida, and Cleveland. Screenings are also being set up at The Cinema Society in Los Angeles, as well as Jewish film festivals and college campus Hillel Houses around the country. The producers also have plans to launch a large digital digital campaign, so for those of you not in these cities, be sure to stay tuned. To find information on upcoming screenings and releases, visit the film’s website at www.putzelmovie.com. Chaet said that Putzel is a film designed to be “equal parts sweet and funny, and a little bit sad.” You know, like any good modern-day fable. And with its quirky charm, relatable humor, and refreshing simplicity, it succeeds. Jewish or otherwise, we could use more stories like Putzel today.